So if you have a child who struggles to eat, know you are not alone. In fact, I can safely say I’ve worked with hundreds of picky eaters in my practice. Virtually all, or at least a vast majority of my clients, with autism were picky eaters. And I’m here to share what has helped my clients. You may be frustrated with how to feed your child nutritiously when they are so restrictive. You may worry about their nutrition intake? And if you are considering a special diet, because you’ve heard a gluten-free and dairy-free diet can be helpful for certain children, you might feel overwhelmed on how to do that. Don’t let that discourage you from trying diet. In fact, having a picky eater is an important reason TO try diet. The good news is that there is a lot you can do when you understand what’s underlying their picky eating habits. And it’s not just behavioral. I don’t use “picky” in a judgemental way, rather a descriptive way: a common term many of us are familiar with. Certainly in some children it can be behavioral. But most often in my practice, I find that is not the case. Many factors influence picky eating: sensory sensitivities, oral-motor challenges, anxiety, fears and medical conditions. But two big influential factors that are often overlooked are nutritional and biochemical: nutrient deficiencies and problematic foods. In this article, we’ll investigate the deficiencies and problematic foods in our diet, and explore what you can do to help your child eat more varied, healthy food that is better for their body and mind. And we’ll explore feeding and meal ideas that help support children with sensory sensitivities. The opioids in foods, like those found in gluten and casein, cause significant cravings/addictions.2 These “addictions” cause children to self-select into a very narrow range of wheat and dairy based foods. What happens in the body is that gluten (wheat) and casein (dairy) are not digested properly and enter the bloodstream as partial proteins, i.e. opioids, that mimic the effects of morphine. They fit in opioid receptors in the brain and drive opiate (morphine-like) cravings/addictions. The child then becomes restricted to only the foods that fuel this addictive cycle, creating very limited and picky eating. As I said earlier, picky eating can be a reason or sign that your child may need a special diet. It’s worth trying to interrupt the pattern, because once the child moves passed the cravings (a few days to a few weeks), their food choices expand dramatically and it becomes much easier to follow a special diet. Most of my clients’ children with autism, initially eat limited amounts of vegetables, if any at all. Routinely though, once they begin a diet (and the cravings diminish and appetite increases), children begin eating more vegetables (or meat) – often for the very first time. Most of my clients report this type of positive experience after progressing with diet. Nutrient deficiencies, particularly zinc deficiency, can make foods taste bland4 or uninviting. When zinc is deficient (a common finding in children with autism), one’s sense of smell is reduced and food tastes uninteresting or unappetizing. Texture can then become an even bigger factor – imagine eating mashed potatoes if you can’t taste the potato flavor – it’s a bland mouthful of mush. Yeast, viral, and microbial overgrowth may cause hyper focus on eating mainly high carbohydrate and sugar rich foods. Yeast and other microbes feast on carbohydrates and sugar. They can actually get their “host” (your child) to crave the food that feeds them by giving off chemicals that get kids to crave refined carbohydrates and sugar. This can create self-limitation to only these foods. There are some children that are very self-limiting and may require additional assistance to broaden their diet. Feeding therapist and various therapies can really help. Also there are medical issues so be sure to ask your doctor as well. NOTE: Don’t remove all foods with the expectation that “if they’re hungry, they’ll eventually eat.” While this may be true for many children, some have real feeding problems and may stop eating altogether, which could be very problematic. Add new foods before removing others. Be sure to seek professional guidance from a feeding specialist or qualified clinician if your child won’t add any new foods. 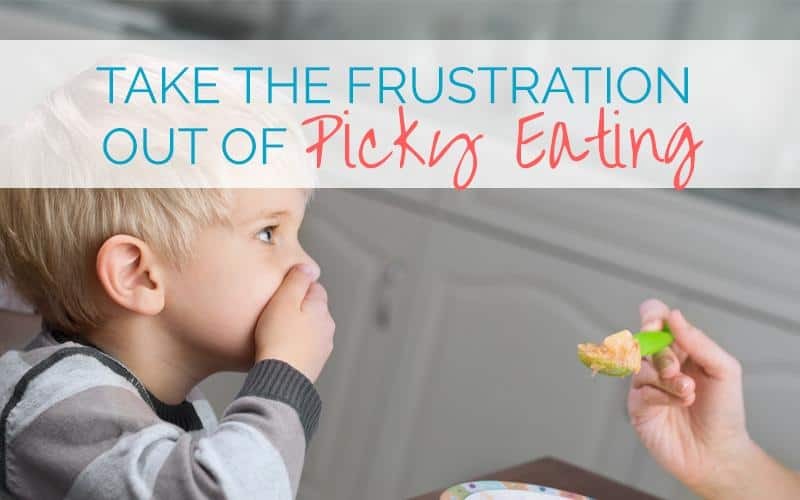 Once you’ve identified possible causes of your child’s finicky eating habits, begin to look for creative ways to address them and get support when you need it. If you have your child’s trust around food and you’re able to make some changes to your child’s diet, consider the following ideas. Don’t let picky eating stop you from implementing a special diet. Indeed, addressing these issues is essential to the effectiveness of any specialized diet because sometimes the diet won’t expand until certain foods are removed. So, before implementing a special diet try to identify new (replacement) foods your child will eat. Then, after the problematic or addictive foods are removed, see if your child will expand their diet little by little. In other words, find several breakfast, lunch, dinner, and snack options for the new diet, often making one-for-one substitutions with foods they already eat. This way, you are not removing any foods in an already restrictive diet. After initiating the new diet, such as GFCF, then begin to try adding new foods and some vegetables of varied texture. Even if your child has been on a diet for a while or has not yet begun to implement a new diet, there are suggestions below that can be helpful for getting new and nutritious foods into the diet. Nourishing hope takes persistence and patience; even the pickiest eaters can progress and benefit from improved diet. Involve your children in food preparation of “new” food. From gardening, washing, chopping, and cooking to WATCHING. Anytime your child participates is positive..
Don’t require them to do anything other than get familiar with it. Consider incorporating the food into therapy or play time. Inform them. Let your child know whether it is sweet, salty or sour. Eat some yourself and tell them how delicious it is. First have them touch it, lick it, or chew it without eating/swallowing it. Start with only a small taste ~ 1/2 teaspoon. Let you child determine the amount. Get creative. Try new food in preferred texture – crunchy, smooth. Avoid being emotionally “attached” – children sense anxiety. Keep mealtime calm. Visualize child eating/enjoying new food. Avoid forcing or pushing – maintain trust. Choose rewards or other encouragement – however not food-based rewards. Make sure your whole family participates – serve everyone at the table. Be creative! Begin to add vegetables where you can and slowly introduce foods slightly differently than they had before. See if you can make food a little different each day – not so much that they reject it, but just enough that they don’t expect sameness – and to get in new nutrients. Add enough salt to make your versions of their favorites more flavorful–don’t go overboard but don’t feel you need to limit salt either. Try mixing or diluting a brand of food/beverage they like with a healthier version in very small amounts until the item is swapped for the new food-this works well for milks, peanut/nut butters, apple sauce and other foods that blend well. Give your child a “mini meal” during snack time rather than “snack foods” so your child does not fill up on empty calories. And it hungrier for their next meal, should they skip snack. Be sure to always keep your child’s trust around eating. If they are extremely picky eating habits do not try “sneaking” things into your child’s favorite foods as they may lose trust and reject the food altogether in the future. With that said, many children do well with “incorporating” (i.e. hiding/sneaking) foods into other foods. If you are unsure, ask a feeding therapist for advice. And most importantly, pay attention to the texture of the food. So choosing the right texture for your child can help immensely with their selective/picky eating preferences, and help broaden them. Based on your child’s preferences, get creative in making healthy foods like vegetables crunchy, smooth, or whatever their desired texture. Add purees to pancakes, applesauce, meatballs, or sauces. Make vegetables crunchy by making carrot chips, sweet potato fries, or vegetable latkes. Hide meat in pancakes (chicken pancakes). I find that crunchy is the most preferred texture. Here are some good tasting and creative ideas for introducing vegetables that come from Cooking To Heal, my cookbook and instructional videos. Make vegetables into crispy, crunchy chips (like potato chips). Use carrots, sweet potatoes, butternut squash, beets, parsnips, or other roots or dense vegetables. Adding vegetables to a smoothie is a great way to get vegetables into a child’s diet. If the child is on the more finicky side, start with vegetables that are not green like carrots. Meat can be chewy and tough. For kids with poor mitochondrial function and low muscle tone, meat can be simply too much effort. Often children gravitate toward carbohydrate rich, starchy snacks that provide quick energy, are addictive, and easy to chew. Unfortunately, this can mean they miss out on adequate protein. For children who do not like the texture of protein, try pureeing cooked chicken breast and add it to muffins or pancakes. Here are some ideas for getting protein and animal foods in your child’s diet. Add a small amount of pureed cooked chicken (approximately 1⁄4 cup, less to start) to a reg- ular our-based pancake or muffin recipe. Chicken pancakes are simply a chicken breast and three eggs blended in a food processor into a batter and poured into a pan and cooked like any pancake. Homemade bone broths are rich in nutrients. Use broth for soups or stews. Cook grains or pasta in broth. Add concentrated homemade broth to sauces. Place zucchini in a towel and twist out water. This is a crucial step. Let zucchini drain as much as possible. Cut cauliflower and steam until vegetable is soft – able to easily mash with a fork. If watery, place in towel and wring out water. Heat oil and sauté onions until caramelized. For ease, skip the sautéing and use raw finely chopped onions. Combine zucchini, cauliflower, and onions in bowl. Add eggs, salt and pepper. Mix with hands. Heat until browned and egg is thoroughly cooked. Variation: Add other shredded vegetables such as carrots. Because of kale and these other low and medium oxalate ingredients, you can enjoy this green smoothie as part of a low oxalate diet. Choose low oxalate berries like strawberries and blueberries, and make sure to consider serving size to keep with a low oxalate diet. Blend together in a blender and serve. While it may be frustrating to cook food and have your child refuse it, try your best to avoid projecting negative energy or frustration. Children are very sensitive and pick up on your cues, which affect how they feel in general and about the food you are serving. Also, is/was mom or dad a picky eater? If so, try having the other person, who can project calm, positive feelings about the food, feed the child. Set yourself up for success by making sure that each meal includes something you know they will eat, along with the new food. Or, when they are hungry at snack time, try a new food. This is a good time to do so because while they may skip a snack, they will not be going without a main meal, and you won’t teach them that if they hold out you will prepare them something new. They will also be a little hungrier at dinner and may be more motivated to try a new item. Getting good nutrition is essential to good health and healing. Begin a special diet and add nutritious foods step by step. You can do it – and your child can too! I have seen many, many children expand their diet. Once food addictions, texture, and exposure to a new food are addressed, you’ll be surprised what your child can eat. Imaging them doing it. Get creative. Try things in a texture they like. Taste it yourself and make sure it tastes good. You’ll be pleasantly surprised when they eat that first vegetable, and more! “Nourishing hope” takes persistence and patience; even the pickiest eaters can progress and benefit from a special diet – including your child. We’d love to hear your story to inspire other families.